Time is running out for Jaylan and Sulana. Headmaster Dumont Fortenz and his supporters from Thunderhead College are spreading their influence throughout the empire and subverting the Sorcery Accords. If the Archives can't find a way to stop Dumont, the empire could be torn apart by a war of sorcery. 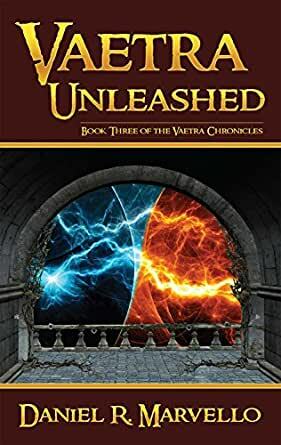 "Vaetra Unleashed" is a swords & sorcery fantasy adventure of approximately 120,000 words/470 printed pages. The series tells a familiar story about an evil mage attempting to take over an Empire. What is nice about the series is that it mixes several different types of magic and has good explanations of each. The heroes don't win every battle and some victories are quite incomplete. This is very well edited too, which can be a problem for ebooks. There is romance, friendship, betrayal, and all the other components of a good story. Recommended. This was the best trilogy that I have read recently. The first book was rather slow but with each chapter as the next two books progressed the story became more exciting. Good love story. I would recommend that you read all three books at the same time. Very entertaining. All three books are matched well and help move the story along. Thanks for the good read. This is a great way to end a trilogy. Marvello introduces new characters and elements to keep the story exciting while maintaining relationships with most of the old characters. The character and plot progressions are superbly done. I didn't leave the book feeling cheated by a lack in any category. Interesting read and good series of stories. Great action, suspense, characters, and plot twist. Does leave you wondering (wandering), and somewhat speculative... which is not a bad state of mind. (Tongue-in-cheak) "general and special realativity abounds...through the looking glass"
This story like the one before it is great. I really love the characters (Jaylan & Sulana) who are working thorough their world and relationship. Thank you.